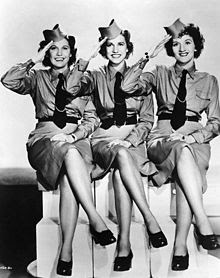 December 24, 1944: The Andrews Sisters were featured in the first episode of The Andrews Sisters' Eight-to-the-Bar Ranch on ABC. Maxene, Patty,and LaVerne ran an imaginary guest ranch. American George 'Gabby' Hayes and Vic Schoen's pop group were permanent guests. The ranch remained on air until 1946.